Ole Gunnar Solskjaer looks likely to select a more-or-less full strength starting XI for Manchester United’s visit to Fulham on Saturday. The Norwegian will be conscious of protecting certain players ahead of next Tuesday’s mammoth Champions League clash with Paris Saint Germain. At the same time, victory at Craven Cottage, combined with Chelsea losing at Manchester City, would take Man United into fourth place in the table. 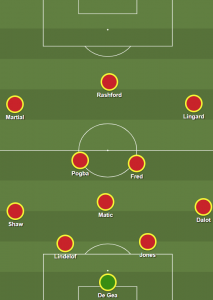 With that in mind, here is how Solskjaer will line up for the meeting with Claudio Ranieri’s team. Solskjaer will want to see his main front three clicking before removing a couple of them to be replaced by Romelu Lukaku and Alexis Sanchez after the 60 or 70 minute mark. This also feels like a game in which Fred could play. The Brazilian has not started in the Premier League since Boxing Day and remains uncomfortably on the periphery of things. You imagine the conditions at Craven Cottage – narrow pitch, lots of the ball, a superior midfield – would be propitious for a midfielder who currently feels invisible. Solskjkaer, along with Lukaku and Sanchez, could bring on Ander Herrera towards the latter stages of the game, affording the Spaniard a chance to produce a ferocious cameo as preparation for what promises to be a huge job against the French champions.